November 22nd 2014 6:00 PM Dinner (7:30 PM show time) Sold out! 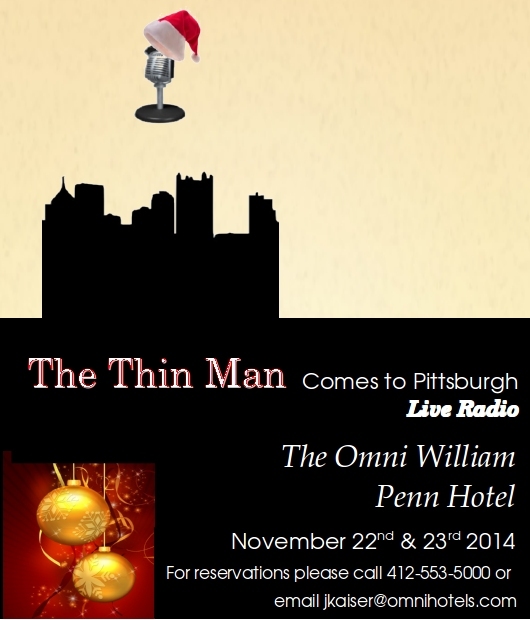 After a sold-out performance last year, ‘The Thin Man’ Comes to Pittsburgh live radio returns to the Omni William Penn during the city’s traditional start to the holiday season. Nick and Nora sort through a cast of retro characters including an eccentric scientist, society ladies, conniving dames and ex-cons. The show is an original adaptation of the 1934 film featuring live performances by local talent and a variety of ‘Burgh references. Who’s innocent? Who’s guilty? What’s certain is there will be plenty of laughs. The story becomes as tangled as a string of lig hts on a tree as murder and mayhem once again mingle beneath the mistletoe. The cost is $50.00. Recommended for ages 10 and up. Individual tickets are available for the show. For reservations please call the Omni William Penn at 412-553-5000 or email jkaiser@omnihotels.com. Produced by Advanced Labor & Cultural Studies.